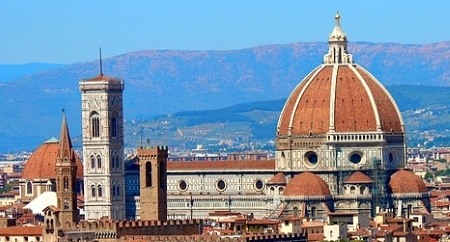 Florence is a city of art, a city of museums and also a city of the most important churches in Europe. Besides the world-famous cathedral in the capital of Tuscany, there are several other world-famous churches. 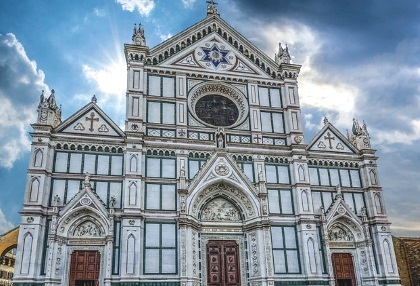 Below is a short list and overview of the five most important churches in Florence. This church is one of the top 10 churches in the world. The famous church in the centre of Florence is undoubtedly the most important sight of the city. The most famous is the very big dome of the cathedral Santa Maria del Fiore, whose construction was not technically possible at that time. But still they made it. The citizens of Florence made it anyway. For many visitors to Florence, the walk to the dome of the cathedral Florence is the highlight of their city trip to Florence. But also the interior of the church, the facade, the church tower and the cathedral museum are very interesting. This church is also in the centre of Florence. In Santa Croce Florence, the graves of very important historical figures are particularly well known. Among others, Michelangelo, Dante and Galileo Galilei are buried here. Besides there are some great paintings and other art objects, as well as in the Basilica Santa Croce and in the Museum of the Church next to the Basilica. 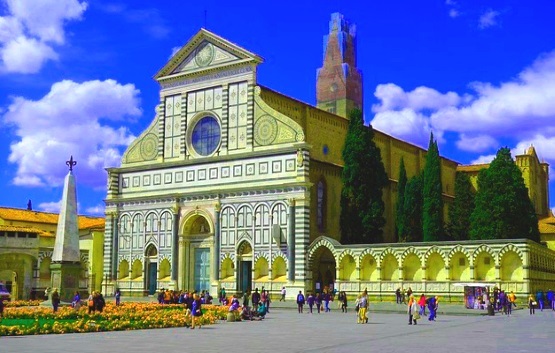 This large church is almost next to Florence Central Station, which is also called Santa Maria Novella. It is the only large church in Florence that has a façade that really dates back to the Renaissance (2-coloured marble white and green). Known inside the Basilica are some paintings, crosses and other works of art. Another large church in the middle of the old town of Florence. It is an old Romanesque and Gothic church. Beautiful frescoes, glass paintings and altar. Also some sculptures outside the church building are world famous. The oldest church in Florence, a church from the 4th century! For several centuries it was the most important church in Florence. The Basilica di San Lorenzo, however, was completely renovated in the 15th century. This new building was built by Brunelleschi, the ingenious builder of the dome of Florence Cathedral. The depiction of the 15th century starry sky above the sacristy is fantastic. Next to it some world-famous works of art. The building is not far from the cathedral in the direction of Mercado Centrale. In the monastery around the basilica is the famous library „Biblioteca Medicea Laurenziana“, an old library of the Medici.